KoopaTV: Pokémon Ultra Sun/Moon: Meet Team Rainbow Rocket?! To recap, my opinion has changed on how different these second versions will be from the first. However, my opinion has not changed regarding my general cynicism towards these second versions. Instead, I am now cynical for entirely different reasons. And, no, don't attack me for being inconsistent or impossible to please. Hear me out. Here's what happened: To ENSURE that this game is not a retread of the Alola we just visited last year, Game Freak put together a new villainous squad, Team Rainbow Rocket. Having it be named after Team Rocket with Giovanni as the head, and then featuring Mewtwo, is a pretty expected Generation 1 nostalgia play. Not surprising, considering all of the Alolan forms are of Generation 1 Pokémon. The rainbow part is really weird, but here's where it gets totally bizarre. Team Rocket Grunts usually have pink hair, and now it's blue! ...Erm, no, it gets more strange than that. All credit for this image goes to kingofthedededes73 on DeviantART. It's now clear that the “alternate story” descriptor used when Pokémon Ultra Sun/Ultra Moon were announced is referring to an impossible alternate universe and timeline. I've read some commentary that this is an alternate timeline where all of the villainous team leaders have succeeded in their goals and have now converged on Alola. This is contradicted by the fact that these team leaders have conflicting goals that can not all come true at once. (There's only so many times the world's population can be wiped out and remade, after all... while still having all of the inhabitants alive. That so many times is zero.) If the team leaders have failed in their goals, then many of the ones that have appeared should either be dead, or reformed and no longer interested in being villains. Either way, there's something wrong. Not to mention that they shouldn't all exist in the same timeline, since the different teams are active at different points in time, rather than simultaneously. I get the feeling that Team Rainbow Rocket will be post-game content rather than complicating the main game. That also goes for the announcement that every Legendary Pokémon will be found through jumping through Ultra Wormholes to other places. Yes, you won't be retreading Alola because you'll be warping off to different parts of the world! There are some missing Pokémon here. That's because there is a distinction between Legendary Pokémon and Mythical Pokémon. 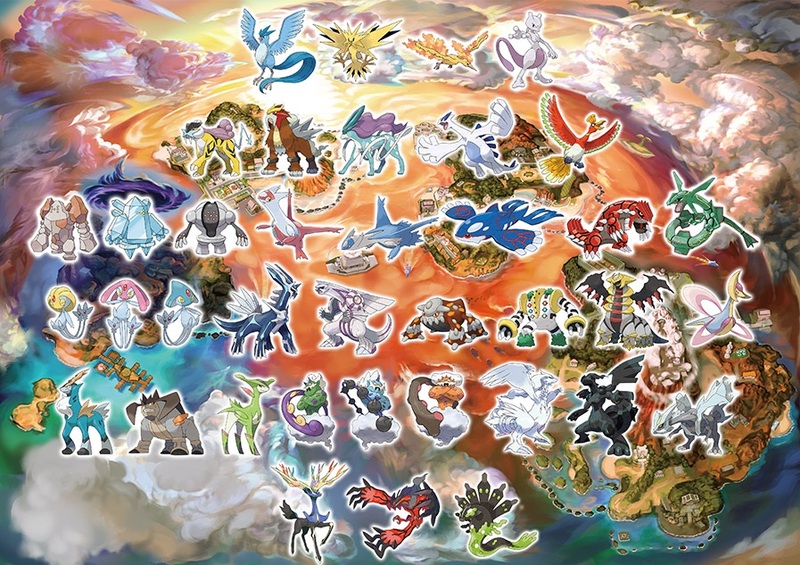 “Mythical Pokémon”, such as Keldeo, Mew, Darkrai, Arceus, Celebi, and others, are event-exclusive Pokémon. “Legendary Pokémon” are obtainable in-game. Both groups are very rare, legendary, mythical, and one-offs. There is no in-universe explanation for these different groups, so it's bizarre to see the distinction enforced like this in Ultra Sun and Ultra Moon. There will be restrictions on which Legendary Pokémon you can warp to in each version. For example, Regigigas, Latias, Palkia, and Zekrom are exclusive to Pokémon Ultra Moon, while their respective counterparts for Pokémon Ultra Sun are Heatran, Latios, Dialga, and Reshiram. I have no idea why Regigigas and Heatran are counterparts, but certain Pokémon will only appear when you have both otherwise version-exclusive Pokémon in your party, such as Giratina for Dialga and Palkia, and Kyurem for Reshiram and Zekrom. ...But the actual way in terms of lore to have Regigigas, which is to get Regirock, Regice, and Registeel, doesn't carry over. Lady Cresselia and Darkrai share a backstory, but Lady Cresselia is a Legendary while Darkrai is Mythical. Thus, Darkrai won't be found in the game. 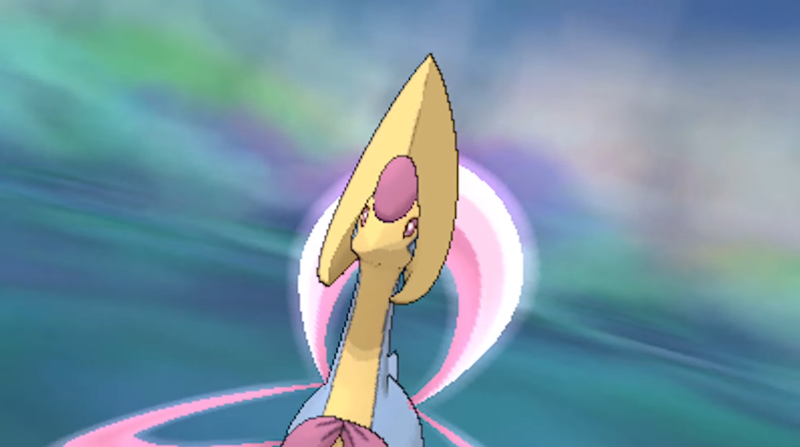 Curiously, Lady Cresselia, despite being the Lunar Pokémon of Fullmoon Island, is not exclusive to Pokémon Ultra Moon. There are some other features as well, such as what appears to be the return of the Battle Factory in the Battle Agency, along with the ability to collect Totem Stickers that appear to be limited to the Totem Pokémon from Pokémon Sun and Pokémon Moon. Perhaps they'll also include the Totems from this game, but regardless, it's limited to a small number of species. With all of these extra changes and features, what am I upset about? I mean, isn't it obvious? They are just throwing the entire series into one game because the game can't stand on its own Alolan merits. They totally threw out what the Alolan potential was supposed to be, instead DESPERATELY putting all of this attention on the closest we'll hopefully get to the average Pokémon fan's dream of “Hey, I thought of an original idea for a new Pokémon game, guys! Why not have a game where you go through ALL OF THE REGIONS?” It's an awful idea if you put any thought into how that game would be balanced. In this case, you won't actually be exploring other regions through the Ultra Wormholes. What is likely to happen is that you'll pop out in a 1–2 room area, similar to Pokémon Black 2 and Pokémon White 2's Hidden Grottos, where it'll just be you and the Legendary. You capture it and then leave. Done. Regardless, at least this constitutes a post-game, which we were worried about since it seemed like Game Freak philosophy was anti-post-game. On that note, does featuring Dialga, Palkia, and Giratina among the Legendary Pokémon on their site mean that this is INSTEAD of a Sinnoh remake, or they are... prepping for one? Guess we'll find out when the series moves to the Switch! When Ludwig talks about the Alolan potential, he means perfecting what Alola promised. He was critical of these games for sticking to the Alolan status quo, and now it seems like they totally forgot what Alola was supposed to be in favour of having the rest of the world (in a very nonsensical and immersion-breaking way) converge on these otherwise insignificant islands. Alola can be good enough without this! Anyway, let Ludwig know in the comments section about your thoughts, and if you think he's going out of his way to not change his mind. Ludwig takes his apology back upon the release of Pokémon Ultra Sun and Ultra Moon. Nono, see, if all the main villains in Team Rainbow Rocket are from a world where they succeeded, I'd say they'll all be from DIFFERENT parallel worlds. Although TBH that sort of decreases the appeal for me--the more a story messes with things like time, alternate timelines, and parallel worlds, the less likely I am to enjoy it. If everyone gets to be in their own parallel world, then they're not really the Maxie/Archie/Cyrus/Ghetsis/Lysandre/Giovanni that we've grown accustomed to and have developed feelings for. They're more like...clones or something. So, answer this: How did Giovanni know to enter those alternate universes to get those specific people? In other words, how does Giovanni even know who these people are? ...Which universe did Giovanni come from? And why did these guys even agree to go with Giovanni? If Giovanni can go around traveling through alternate universes, then why didn't these guys do that? Hell, why doesn't everyone go do that? Why care so much about the universe this game takes place in when you could just warp to another one? I hate this crap. It makes it so nothing matters. I guess because these wormholes started opening up all over the place? Don't ask me! Who knows, maybe there will be an actual explanation. xD The ones like Archie and Maxie who think they're doing good things might go with him on the promise that they could "help" another world. Cyrus is bored, Ghetsis probably wants to control more people, and I don't even remember what Lysandre's deal is. Lysandre didn't like the world because it's ugly, I guess. He might go along because Team Rocket is extremely fashionable — significantly moreso than Team Flare. So what happens when Team Rainbow Rocket has a staff meeting and Archie and Maxie see one another, having canonically defeated the other in their own timeline? I meant what his goal was. I guess in one version he wanted immortality and in the other he was going to kill everyone? I remember him feeling like a less-interesting Cyrus to me. Hopefully Giovanni has explained the alternate universes thing to them and gotten a promise that they won't fight. Or something. Less-interesting Cyrus is pretty accurate. I never really saw Giovanni as a peacemaker or negotiator. If you look at some of the other conversations in this comments section, you'll see that I'm criticising Team Rainbow Rocket for not being a "team" at all, since each dude identifies with their original team. I wonder how much the game will explore everyone's individual portion/contribution to what the team is doing, or if they'll just throw all of these crime bosses into one kinda blob and not go into any depth. It's worth nothing that Archie and Maxie are in their pre-ORAS designs. Maybe part of the plot will be that trying to get these guys to cooperate is a disaster. It's also Ghetsis from Black/White, not BW2. 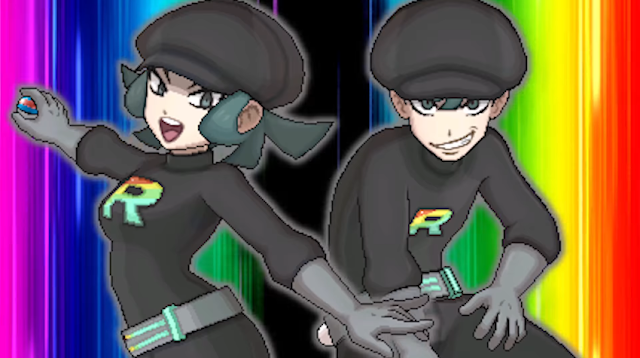 Somehow I don't think they'll delve into inner Team Rainbow Rocket politics. If they actually do a good job of it I miiiight buy the game and change my opinion. BUT, BUT, BUT, this trailer also identifies that you will be able to have PRIMAL KYOGRE and PRIMAL GROUDON and MEGA RAYQUAZA. How do you explain THAT? They come from different dimensions than the ones Maxie and Archie come from, of course! So... 5 different dimensions just for one generation? "WHAT AM I FIGHTING FOOOOOOOOOOOOOOOOOOOOOOOOOOR?" All of your comments before this were well-thought and fantastic. WOT HAPPENED? A good author ought to play with the expectations of his audience. I really appreciate the return of Team Rocket, as they were always the best villainous team in my eyes. Not just because of nostalgia, but because they're motive was earnest. No megalomaniacal schemes, no planet transforming hybris - just greed. Giovanni reminds me of a mafia leader, a string-puller, an elusive shadow; while the other Team leaders might as well come straight out of a nuthouse. On a site note: in the trailer, Giovanni has only 5 Pokémon, which either means the fight isn't taking place ultra late in the story or, maybe more likely, that the game continues on being too easy, just like XY and SM, which is, in my humble opinion, the biggest flaw of main series Pokémon games by far. They play up Team Rainbow Rocket as the greatest villain organisation in history, but there's one problem. When you're battling non-Giovanni, say, Maxie, it's "You're challenged by Team Magma Maxie!" How can you be a great villainous team without any harmony between your commanders? 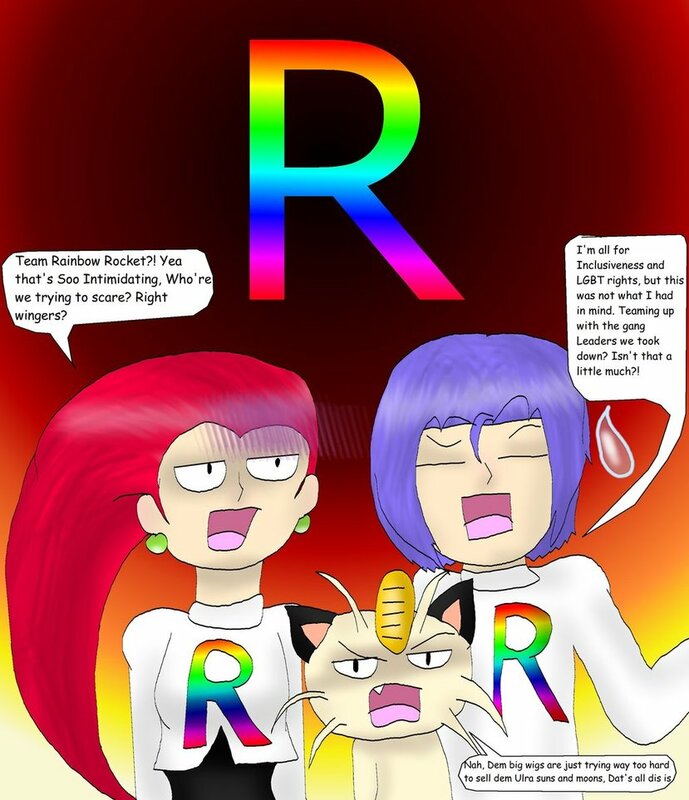 Maxie and Archie and friends don't self-identify as Team Rainbow Rocket. They identify as their original teams. There's no teamwork. No cohesion. You can have the celebrity star power on your team, but without teamwork and coordination, then it's a pretty weak group. Also, it's entirely possible you may battle Giovanni... MORE THAN ONCE! "This is also why they lose; unlike the heroic team they fight, the villains never trust each other. One of them will betray the rest of the group. [...] Other times, one of the villains has planned the whole team-up as a trap from the start." "Also, it's entirely possible you may battle Giovanni... MORE THAN ONCE!" That may be true, but repetition isn't really the success recipe for a good boss battle. The non-plus-ultra in terms of Pokémon boss battles was Evice from Pokémon Colosseum, GameFreak could use some learning from it's own past games. Well, as we know, Pokémon tradition to battle the team boss more than once, though. So... no game has a successful recipe. I never actually got to Evice, because I wanted to capture all of the Shadow Pokémon in the game but I kept failing to successfully capture the four trainers' Shadow Pokémon atop the Realgam Colosseum (including Shadow Miltank!) plus Nascour without fainting. Well, Team Rainbow Rocket is being marketed as THE GREATEST team of all time but, I mean, it's so transparently obvious they aren't. Can I assume these comments come from the "rainbow" part? This reminds me of the Battle Tree, where all of the legends were to hang out and battle. It was supposed to be the highlight of the game. I expected an epic storyline to occur, where I get to go back to Kanto (especially with Lillie going there), but nope. They're just battle NPCs. Good point on the Battle Tree. They got this whole thing in the last minute about that, battling legends with dialogue and special music. Except what's in that trailer is literally the entire extent of what's in the game. At least there's good music. Thaaaaaaaaat's not much of a silver lining. Lapras approves of this article.